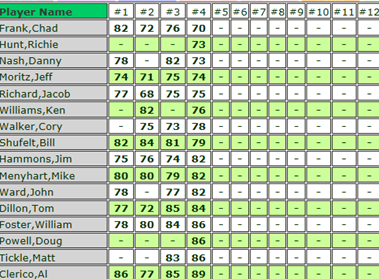 This past weekend, I played the Orlando Amateur Golf Tour event at Victoria Hills and came in 2nd with a 73 (+1). 1. Driving – I routinely was hitting the ball 40-yards past my playing partners. On #2, I hit one about 60 yards past my playing partners and on #18 I was about 80 yards past my playing partners (unfortunately, I was in the woods). 2. Short Putting – Putts inside 6-feet tend to give me a lot of trouble, but I made everything outside of a 3-1/2 footer on 18. That was due to a leaf blowing right in between the putter and the ball as I was making my thru-stroke. 3. Mental Game – I was good and focused pretty well. For the most part, I was focusing on my target and the shot I wanted to hit and nothing else mattered. I was also sticking with the mentality of hitting great shots and accumulating great shots instead of worrying about avoiding bad shots and fretting over a bad shot. 1. Iron Play – I only struck 2 irons well all day, the approach on #1 with a P-Wedge that still ended up 40-feet short of the hole (still on the green). And a punch 6-iron into a wind on #13 that flew the green. 2. Drives on the Par-5’s - I only found 1 fairway on the 4 par-5’s. And that was not particularly a great drive, but I ended up making birdie, anyway. I had 3 impeded shots on the other 3 holes. Snap hook on #9 which is uncharacteristic of me. The drive on #15 requires a large draw and I struck it well, but pushed it. I flew the bunker and ended up in the St. Augustine grass. I actually hit a great shot on the 2nd shot, but was screwed over as the ball ended up just short of the bunker and I should have been given a free drop due to Ground Under Repair (it rained that night and morning). I made par. Then on #18 I hit one of my longest drives all day, just pushed it a little and I had to hit a rescue shot out of the woods. But, 4 good drives on those par-5’s and I could have easily played them at -2 under and won the event. 3. Birdie Putting – The greens were smooth, but slow and the pin positions were on some big slopes. Still, I struggled to get the ball to the hole. Speed control was an issue. 1. Continue to work on the irons, particularly the mid-to-short irons. 2. Acquire the mindset of treating all par-5’s just like you would a normal par-4, take your stock swing and focus on making good contact and finding the fairway. 3. Work on speed and distance control drills. I played in the event to get some experience of playing in tournaments, again. I had not played in an event in 2 years and I was looking to play in the FSGA Mid-Am in September, so I wanted to get some tournaments to help with comfortability of playing in competitive events. I also wanted to use this experience to test my game and see where I’m at. They had the tee moved up on this particular hole. I have only played this hole from the back tee, so I wasn’t sure what to hit. It played to about 390 yards. I hit a 2-hybrid and had 145 yards to the middle of the green and I made the right play. The only hole I regret hitting driver on is #6, the 380 yard par-4 (it goes downhill a bit, so the ball flies further and rolls more. I hit driver and didn’t execute and ended up in the left woods where the red X is located. The issue with this is that the area indicated by the yellow X was very unkempt and I could have made a pretty good swing and ended up there and have a very tough lie. That narrowed the landing area considerably. The woes of not playing a practice round. If there was some neat ‘golf drama’ on this level, it was between myself and my playing partner, Danny Nash. Nash also shot 73 (I beat him when we matched scorecards as I birdied #1). We were tied going into the Par-4 16th hole which plays about 360 yards, but is straight uphill and fairly narrow with trees right and left and a fairway bunker left. Nash hit 3-wood off the tee and I hit driver. Nash was playing the old ‘if I hit 3-wood, I’m only going to have about 140 yards into the hole.’ My mentality is that I know if I take an average pass at the ball, I will likely be just fine. Nash hit the fairway (yellow X) and I hit a hard driver that also found the fairway (Red X). The advantage clearly went to me as I was about 50 yards ahead of Nash with 85 yards to the hole (the pin was all the way back). But Nash stuck an approach shot to about 7-feet. I then hit a good SW, but it spun back about 10-feet and I was left with a 25-footer. I missed my birdie putt well short and was happy to make the par-save and Nash made birdie to go 1-up. Once again, Nash played the more conservative shot with a 3-wood off the tee and I hit driver. He put his 3-wood in the bunker (red X) and I blasted my driver right down the middle to about 70 yards (yellow X) to the hole. Nash hit his fairway bunker shot well short and I stuck my L-Wedge to 8-feet. Nash ended up with a bogey and I made par to go 1-up. That was before I blasted my drive on 18 into the woods and came away with a bogey and Nash and I tied for score. 1. To have the mentality of trying to hit great shots because you can’t play great golf unless you hit great shots. And trying to accumulate great shots instead of focusing on avoiding bad shots. 2. Avoid making bad strategic errors (sometimes I get so aggressive that I take shots that are too low of a percentage to pull off). 3. Have no worse than an average performance with my short game and putting. Nobody can get putts to fall with any consistency, but if I can avoid terrible rounds putting and with the short game around the green, I can at least continue to be aggressive because if I miss a GIR, I can still save par. And if the putts start to drop, then I can get into the 60’s. I think I did a pretty good job with all 3 goals. I did have some issues with feeling comfortable with my irons and sometimes I didn’t hit good enough putts due to being timid. The only strategic error I think I made was on #6 (drive into the left woods), but that was due to having not played a practice round and I still made par (and hit the GIR) on the hole. I would say that my short game was at least at the average. I had a couple of poor shots and a couple of great shots and mostly average shots. And my putting was likely a little below average. I left myself with too many putts with ‘some meat on that bone.’ But I only missed 1 putt I should have made and countered that with a 40-footer I made on the first hole. Overall, it was a fun experience and I like how it tested my game so I know what to work on. Good little write up Rich and well played! Follow our trades NOW and gain up to 270% a day.